Autoclaved aerated concrete; High density and radiation-shielding concrete; High strength concrete; Sprayed concrete (Shotcrete); Hot weather concreting; Underwater concrete; Fibrous concrete reinforcement; Lightweight concrete; Self compacting concrete (SCC); Recycled materials in concrete; Formed concrete; Polymer concrete; Future developments in concrete. Concrete is the most widely-used construction material in the world. This important book summarises the wealth of recent research on improving qualities such as durability and sustainability as well as the emergence of a new generation of specialist concretes for particular applications. A number of chapters discuss new types of concrete such as autoclaved aerated concrete, high-strength concrete, sprayed concrete, fibre-reinforced concrete, lightweight concrete, self-compacting concrete, foamed and polymer concrete, together with their characteristics and applications. Other chapters review the development of concrete especially suited for particular conditions such as radiation protection, hot weather and underwater conditions, as well as the increasingly important area of recycling. 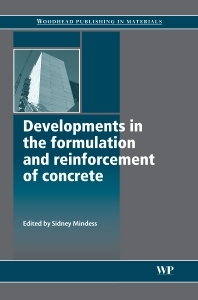 With its distinguished editor and international team of contributors, Developments in the formulation and reinforcement of concrete is a standard reference for civil and structural engineers. Dr Sidney Mindess is Emeritus Professor of Civil Engineering at the University of British Columbia, Canada. He has an international reputation for his research on concrete.